Imagine one day you strike up conversation with a stranger and happily discover you share an addiction to collecting antique textiles - kinship over old threads - love it!. This new friend, Anna, confides that she is in the process of downsizing and is building her very first 'new-build' home. 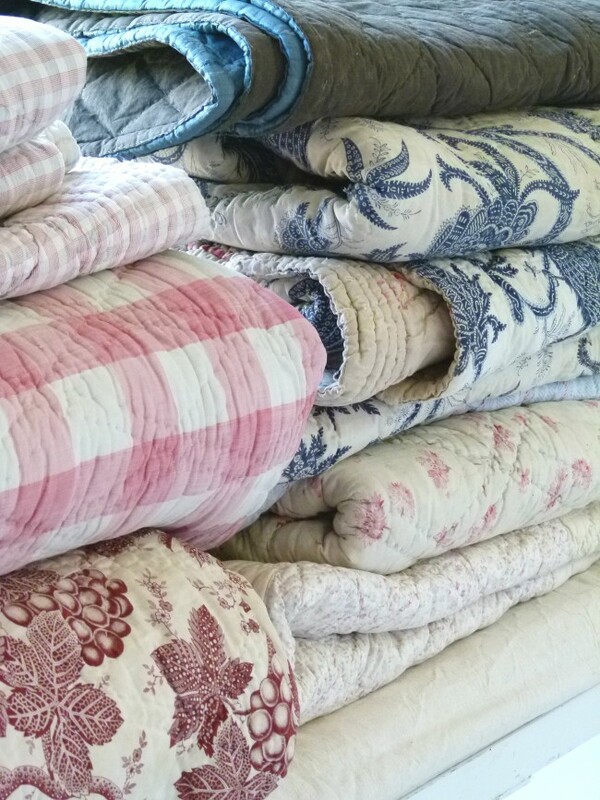 It turns out she just so happens to have boxes upon boxes of antique textiles; ticking; linens; tapestries; 1800s fabric, antique Provencal piqué and boutis in storage and would love to find a way to sell them without having to drag them around from one antique fair to another. I mention I have a group of kindred spirits coming to Provence for the French Muse experience and the idea for a private textile brocante sale is hatched. I went to visit her a few weeks before our retreat and as I stepped over scaffolding and into her beautiful home it became very obvious that Anna has an incredible eye, even in its unfinished state, there was a delicious marriage of pattern, texture and light, I was ready to move in if she invited me to! ....Somehow she had forgotten to mention she has been featured in many quintessential books about Provence and interior design.... I remember the heat of a blush forming when I realised my new friend was a pretty big deal.... and I was literally stepping inside the pages of one of my favourite interior design books - 'Textile Style'. Anna brought me to a little sideroom and started to open up random cardboard boxes to show me what she had put aside for sale for our private French Muse brocante.... my textile taste buds salivated and I lost a good part of my heart in that little room pouring over the contents of these boxes. For nights afterwards, I dreamed of the patterns, of the little rips in the timeworn fabrics lovingly repaired with delicate tiny handstitching, the tattered silks, even the smallest most throwaway cuttings whispered to me to make, to create, to take them home. We saved our visit to chez Anna to our last full day of the French Muse experience. The morning of our visit, I rose earlier than planned, too excited to sleep with all that we had planned and I couldn't wait to share Annas vision and creativity with our guests. An incredible textile artwork caught my eye, a one of a kind creation made by my hero, the inimitable Michel Biehn - whose book, La Conversation des Objets, is my go-to book for inspiration. Just off the living room, Anna brought us into a beautiful guest bedroom with William Morris wallpaper and a family heirloom portrait. Annas home has textiles and art from all over the world, an ancient African tribal ceremonial skirt hangs opposite an antique Swedish gold leaf mirror. A side table covered with a patterned Provençal antique piqué sits beneath a very contemporary sculptural artwork. It is beautiful, understated and intuitive. An 1800s portrait of Annas mother as a child, the background is gold leaf and absolutely mesmerising. 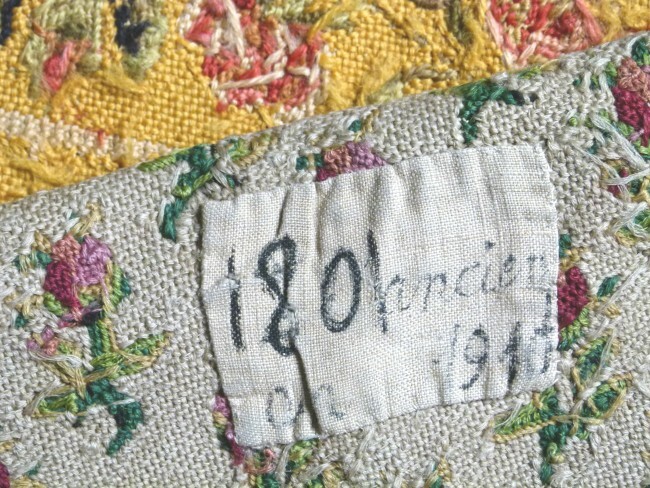 Antique tapestry with original tag handsewn...be still my heart! Morning light streamed in through the living room illuminating one of the stacks of antique French ticking that Anna had chosen to part with. A once in a lifetime experience that I am so grateful for. Thank god for the Irish gift of the gab! Now to start planning our September French Muse experience!